Press the rightkey to let the display show the input or the output voltage. 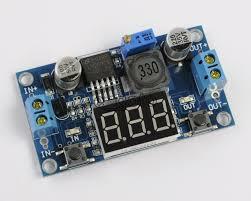 adjust the right button so that "OUT LED" lighted, the voltmeter shows the value of the output voltage. Press the right button for more than 2 seconds, release, voltmeter and "OUT LED" flashes in synchronization so that uou enter the output voltage calibration mode. press right button for more than 2 seconds, release, to exit the output calibration mode. All parameters set to automatically powe down to save. adjust the right button so that "IN LED" lighted, the voltmeter shows the value of input voltage: press the right button for more than 2 seconds, release, voltmeter and "IN LED" flashes in synchronization so that you enter the input callibration mode. 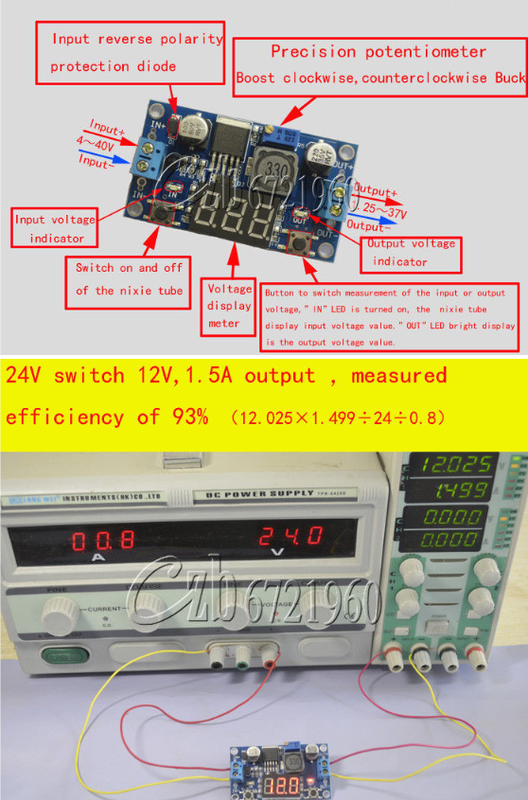 steps 2 and 3 consistent width the output voltage calibration method. The module can not be adjusted, the output voltage is always equal to the input voltage. Counter clockwise rotation of the potentionmeter 10 laps or more, than you can adjust the output voltage. Factory default outpt voltage is 20V.